Colour theory is the foundation on which I base all my food styling and photography. It is the basic principle I use, and my foremost consideration on every shoot. 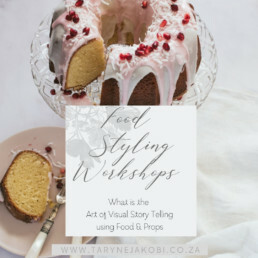 The colours of the food ( and the colour theory to be applied to that particular food ) will determine all the other styling elements, background and props, lighting and mood, composition and balance that I then use to build my visual story. Colour theory is the strongest and most powerful tool in creating a food story in food styling. But, I hear you ask, why exactly is colour theory? There is really a lot of information on the web, and I suggest read through a few articles, in short, I think this quote is a good definition of what colour theory is. “Color theory is a term used to describe the collection of rules and guidelines regarding the use of color in art and design, as developed since their early days. Color theory informs the design of color schemes, aiming at aesthetic appeal and the effective communication of a design message on both the visual level and the psychological level. Colour theory in food styling plays a number of roles, firstly, and primarily is to create visual interest. We eat with our eyes, and an appealing or appetising image will immediately attract the viewers attention. Secondly, the colours communicate as the quote above says, on a subliminal, or psychological level, for example brown, rust, orange and amber colours are considered warm colours and they communicate warmth, and the associations that go with that particular though emotion, such as comfort, down to earth, natural goodness, autumn, relaxed and mellow. Green colours communicate the opposite message, the psychological associations with green are, spring, new, freshness, energetic, healthy and young. Different colours, and different colour combinations will therefore not only tell different stories, but also evoke different moods provide context, and clues to your visual narration. Based on the colour wheel, there are 2 fundamental basics which apply to food styling. Firstly the warm and cool colours on the colour wheel and what they communicate in terms of food and mood. If you were to look at the colour wheel and draw a circle down the middle you would divide the circle in half, splitting the colours of red, yellow, orange, from the blue, green, and purple. The red, orange and yellow colours are considered warm colours, and the blue, green, and purple colours are considered cool colours. The principle of warm or cool colours is elementary to the visual narration, if you are styling a story around comfort foods, lovely homely soups, rustic artisan breads, and other wintery indulgences, it would be incongruent to use a blue background, and props. Blue is not a warm colour, so instead of evoking the feelings associated with warmth and comfort the story now looks odd, the visual clues are clashing, as opposed to bringing the story together, as they are telling two different stories. The second principle is colour schemes, or colour combinations. I love composing a food styling story around a particular colour scheme. It is the most effective and consistent way to create a visually interesting image. There are a number of colour scheme based on the colour wheel, complimentary colours, are colours opposite each other on the wheel, analogous colours, are the colours next to one another on the colour wheel, triadac colours are those which are evenly spaced apart on the colour wheel, and a monotone colour scheme is one single colour with various shades, and tones. Below are some examples of the various colour scheme and how I use them in my food styling. Complimentary colours are colours opposite each other on the colour wheel, red-green, orange- blue, yellow- purple. 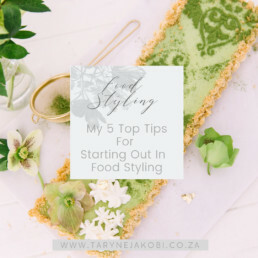 In food styling they are the most effective, and most dynamic combination because there is a sharp contrast between the two colours, they can really make the food and imagery pop. The downside is that certain combinations can look cliched ( think the typical red & green of Christmas) and overusing them can get tiresome. In the example below for a story on Avocados, I freshened the traditional red & green colour scheme up by replacing red with pink as a complimentary to the green of the product, the result is a dynamic and modern image that is unexpected and visual appealing. Analogous coluors are colours that are situated alongside each other on the colour wheel. Because of this, they naturally form the most harmonious scenes in food stories. An analogous scheme is usually made up from one primary ( blue) , one secondary ( purple) and one tertiary colour ( violet/ and or pink) as seen in the examples below, and is often found in nature. Analogous color combinations can also be made up from more than just three colors. Triadic colors are evenly spaced around the color wheel and tend to be very bright and dynamic, so they work particularly well in food styling for summery type stories: think of the classic BBQ combination on red & blue check tablecloths, with accents of yellow in the decor and food, such as sunflowers, or whole corn on the cob, or the example below of the watermelon margaritas, the red of the fruit, the blue background, and the green in the garnish from the mint, and limes. A triadic scheme creates visual contrast and harmony simultaneously, making each item stand out while making the overall image pop. Monotone or monochrome is not restricted to only black or white, a monochromatic scheme can be any one colour, and varying tones, tints and shades of that particular colour. This is not commonly used in food styling, although in the example below it is a very effect way to tell the particular food story. The green background, green props, and green food all tell the story of feature, Kale. The story centred around the Pantone colour of the year 2017, it was called Kale, and so I did a food story featuring Kale as the food element along with the colour. It is a dynamic and visually interesting story, the different textures of the food add interest while the single colour keeps the focus on the hero of the story, the kale.